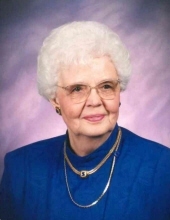 Mary Frances Kluehe, 92, passed away on November 19, 2018 at the Washington Odd Fellows Home in Walla Walla. Viewing will be Wednesday, November 28th from 12:00pm to 6:00pm at Mountain View-Colonial DeWitt, 1551 The Dalles Military Road, Walla Walla, WA. A Private interment will take place at Blue Mountain Memorial Gardens. A Celebration of Life service will be Thursday, November 29th at 2:00pm at Trinity Baptist Church, 595 Abbott Road with Brad Henderson officiating. Mary was born to Kenneth Ora Bembry and Hattie Martha Landers in Stanton, Texas on February 24, 1926. Her mother died when Mary was a young child in the Texas Panhandle. With her father and brother Bill she moved to Hobbs, New Mexico where she graduated from high school. She began business school in Long Beach, California during World War II but soon found office work in the shipyards. During this time she met her future husband Bernard who had been serving with the aviation engineers in the Air Corps. With his discharge at the end of the year, the two were married in Las Vegas, Nevada on November 1, 1945 and decided to seek solitude by purchasing a farm at Burnt Woods near Corvallis, Oregon. They soon discovered they weren't farmers and moved to Portland's Vanport housing project. Mary was in California visiting relatives and Bernie had gone to the coast for the day when the Vanport Flood wiped out their home in 1948. Mary, Bernie and family (which now consisted of three daughters and one son) moved to Walla Walla in July of 1957 so Bernie could take over the position as Superintendent of the Walla Walla Rescue Mission. Mary worked in the Walla Walla and Birdseye canneries and was in charge of the Mission Auxiliary all while caring for four children. They joined Trinity Baptist Church where she also was active as social chairman of the Women's Fellowship, taught Sunday School, and was an advisor and subsequent President of the Christian Business Women's Council. Mary also worked full time as the manager of Newberry’s furniture department and then at the Bon Marche until she retired in 1981. Mary enjoyed sewing and also made many beautiful Russian embroidery pieces. She and Bernie enjoyed camping in their fifth wheel and just being away from the city and out enjoying nature. They also enjoyed riding motorcycles and took a trip to the Midwest on Bernie's Moto Guzzi. After her husband died in 1991, Mary started a group for widows at Trinity Baptist Church. They were able to fellowship and support each other and met regularly for lunch or dinner. Due to health issues she spent her last years at Washington Odd Fellows where she made many friends and participated in the Trinity Baptist Sunday Services while she was able. She was a very outgoing and friendly person, a good friend and mother, grandmother, great-grandmother and will be missed by all who loved her. Mary is survived by three daughters: Lianna (Richard) Lynn; Beverly (Lytle) Jim; Janel (Christopher) Rood; a son Arman (Sandra) Kluehe; two grandchildren: Kimberly (Derek) Olsen, and Karla Rood and two great-grandchildren: Lily and Tabor. She was preceded in death by her parents, her adoptive parents, her husband Bernard, a brother, nephew, two adoptive sisters and an adoptive brother. Memorial contributions may be made to the Christian Aid Center (Walla Walla Rescue Mission) through Mountain View-Colonial DeWitt. Friends and family may share memories and sign the online guest book at www.mountainview-colonialdewitt.com. To plant a tree in memory of Mary F. Kluehe, please visit our Tribute Store. "Email Address" would like to share the life celebration of Mary F. Kluehe. Click on the "link" to go to share a favorite memory or leave a condolence message for the family.